Spring C-Clip / Mount / Holder for Smartphone on Camera Tripod [AP003674] - $0.95 : allputer.com - Accessories for all your Portable Electronics & Computers! 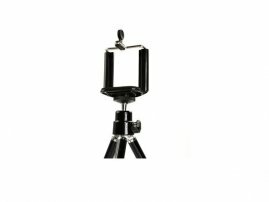 Mount your smartphone or mobile device to any standard tripod - with this Tripod Mount. This accessoryis designed and engineered to work with all smartphones including iPhone, Android, BlackBerry, Windows Phone, FLIP MinoHD, UltraHD, and all models of the iPod Touch. The Tripod Mount is small enough to travel with you wherever life takes you. Once you've attached the Tripod Mount to your tripod, just pop in your smartphone or mobile device and you're ready to go! Its quick access mount lets you instantly swap devices. Capture one scene on your phone and switch to snap another picture on your device. The Tripod Mount can be used on any tripod with a standard ¼ x20" camera mount. - Holder expands to accept devices up to 3.00" (8cm) width, big enough to hold a Galaxy Note Series Smartphone. - Compatible with: iPhone, BlackBerry, iPod Touch and even Samsung Galaxy Note phone. - Case Friendly / Case Mate / Case Compatible: you don't need to take off the screen protector or protection case of your device, just mount your device to the holder. - iPhone 6 4.7" / iPhone 6 5.5"
- Holder expands to accept devices from 2.5" (65mm) up to 3.00" (80cm) width, big enough to hold a Galaxy Note Series Smartphone.